let me put this out there straight away. i stopped eating any and all meat (i was pescatarian for a number of years) when i was 18. the reasoning for my 180 was simply that i'd had enough. my dad's family was extremely poor growing up and to him a sign of success was to be able to feed his family and provide what his parents could not. so, it was steak, baked potato, and salad with italian dressing probably 4-5 nights a week in the straza household. i couldn't do it anymore. having said that, my body has been craving protein recently in the form of a steak or burger. i've had maybe half of two burgers and a bite of my husband's steak since that birthday. that's about to change, at least for a minute anyway. enter le relais de l'entrecote. tonight my husband is taking me for my few bites of their famous steak along with a ton of frites and sauce. i’m more than a little excited not only for the food but to get my french fix. this should last me, save my need for sugar, for more than a few years of semi-healthy eating. with a handful of outposts, the long-awaited beverly hills site was unveiled to mixed reviews...but i have faith. they only recently opened so there are bound to be hiccups. b.h. is about 45 minutes from malibu, but trekking out of my sleepy town is something i rarely do mostly because of time and traffic. i have to make a real effort to go “over the bridge” from malibu proper. 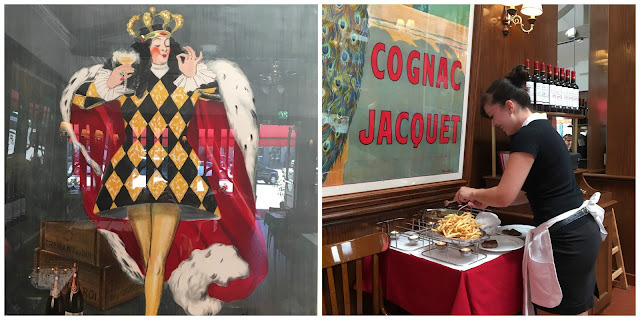 i’ve raved to my husband about the frite and sauce at l’entrecote for years as i’ve gone there on many visits to the saint-germain de pre area in paris specifically for them. we finally had the chance to go and he loved it! needless to say, i fell in love years ago with the simplicity, efficiency and yumminess of this true parisian bistro. they ask but one question in french “how do you want your steak cooked?” suffice to say as a meatless eater the wait staff looked at me like a confused dog. i was there for the fries and sauce, salad on the side. period. did i mention the not so “secret” sauce??? sorry, can’t help it. the recipe was first kept in the kitchen of the owner, then a lab and now a bank vault. this recipe was closely guarded until l’entrecote lovers deconstructed it and the owners took the sauce stealer to court winning a fair amount in the verdict. you can find a number of recipes made with chicken liver but the real deal is said to not use any in the sauce. whew! not sure i could do it. i’ve not been to the melrose location yet but i’m guessing they serve the same menu as the paris location. 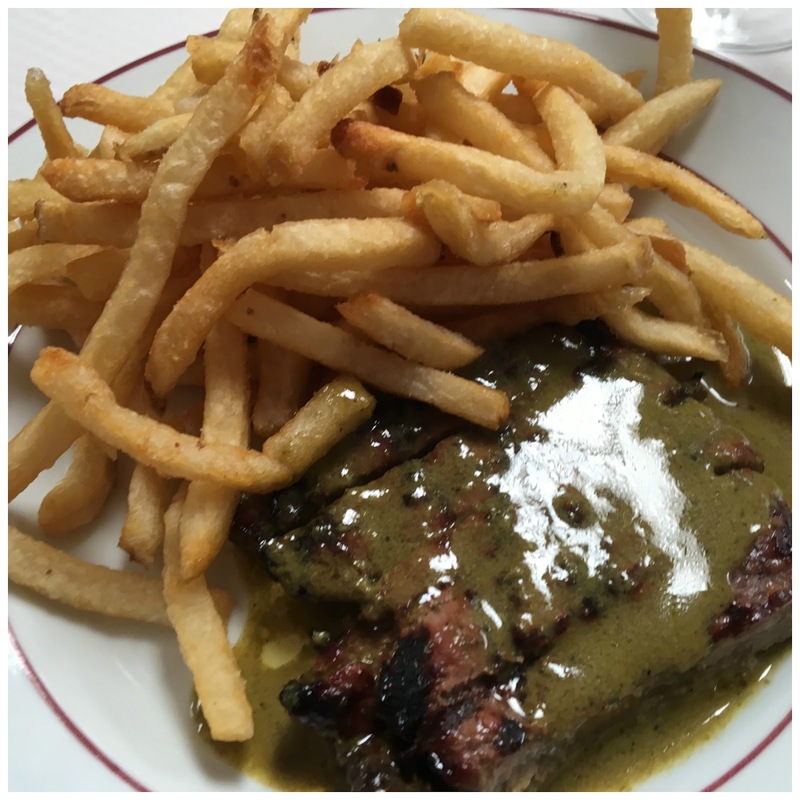 steak frite, a salad and une montagne de frite, a mountain of fries, presented with the steak smothered in a buttery herb sauce. like i said, yum!